Really! Leave this oil pan for the car. 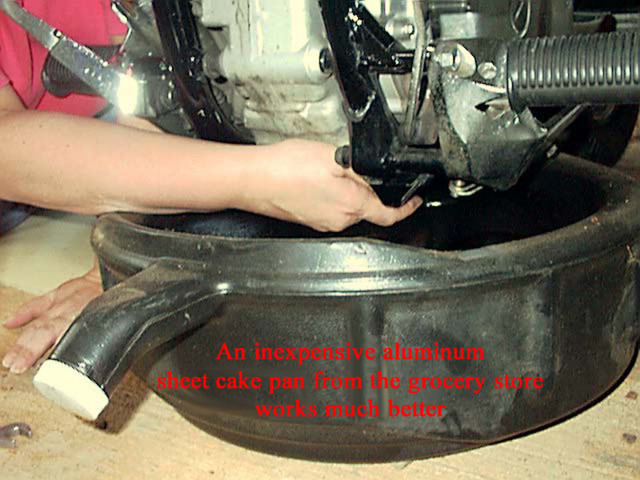 One of those long flat cake pans at the grocery store is cheaper and fits better, as long as it holds 2 quarts. 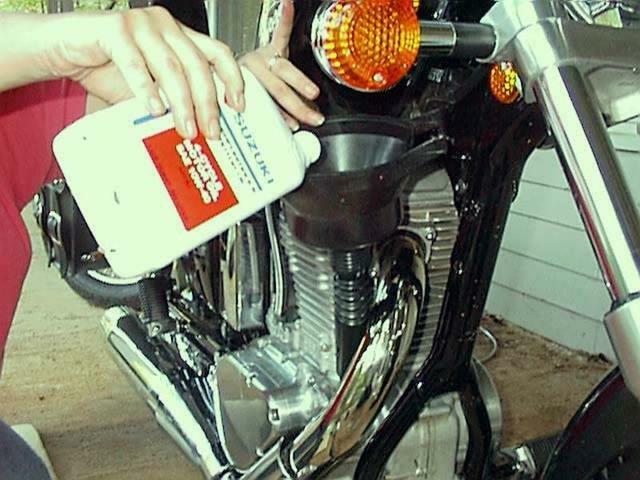 I also like to lift the bike off the side stand when draining, to get the old oil in the alternator cover too. 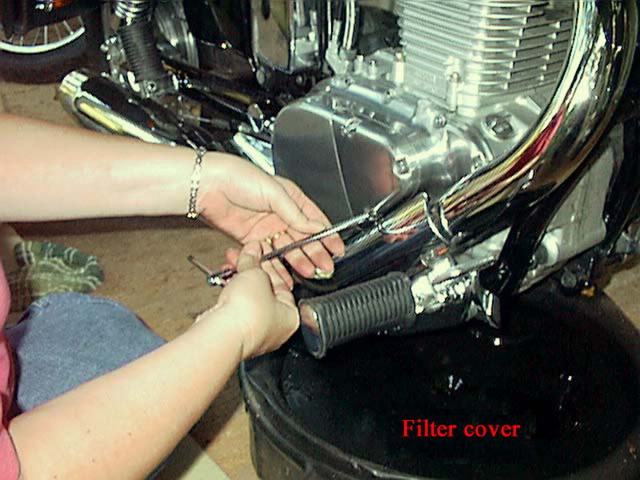 The oil can look bad, but the filter is still good to use. 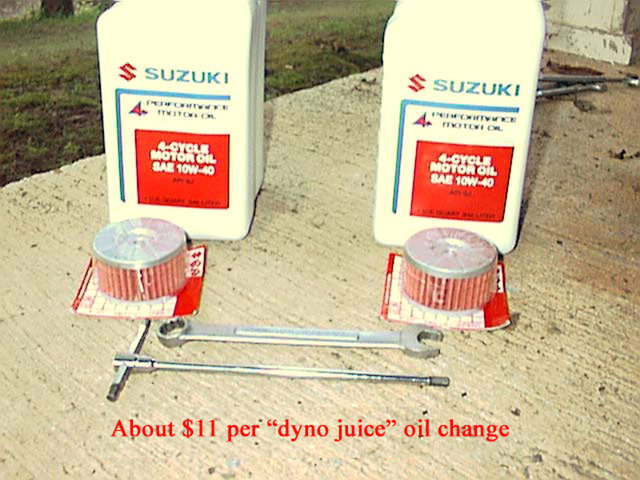 I change them with every other oil change. 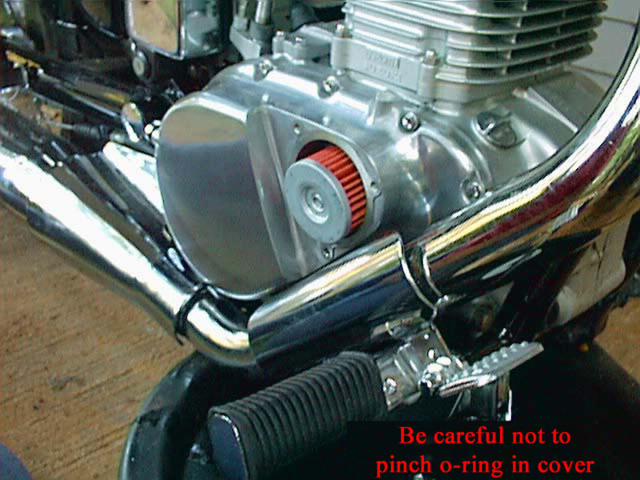 Check this o-ring for pinches or cracks. If it's okay, use it again. Don't forget the spring inside the cover. Use a clean funnel. I keep mine wrapped in an old rag to keep out bugs and dirt. 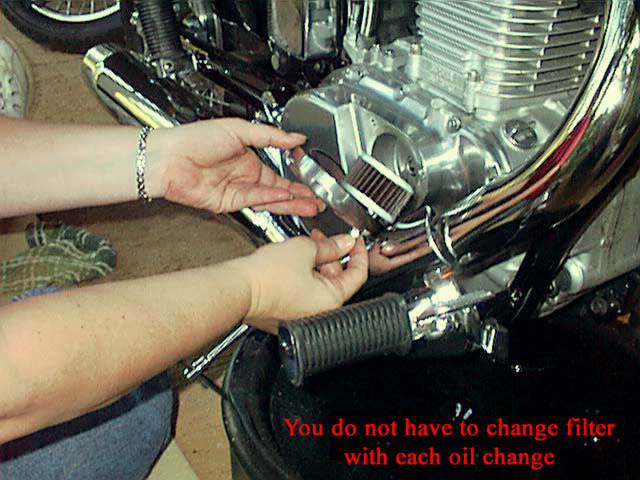 With practice you can learn to hold the bike vertical with one hand while checking the oil level. 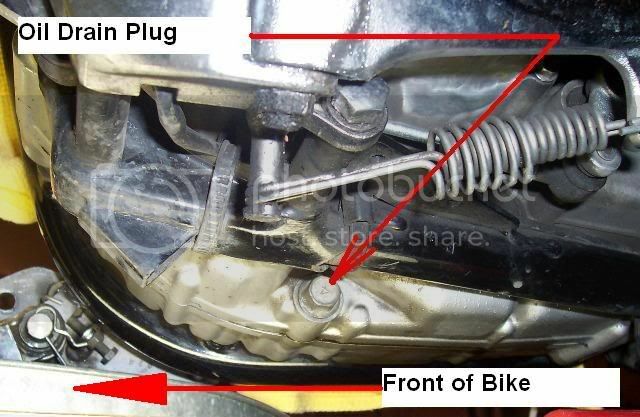 While you are down there getting intimate with your bike, look under the belly for a black rubber puke tube with a plug in the end of it. It comes down from your airbox just behind the engine block. Put a small pan or rag under it and remove the plug. There will probably be some oil and water mix dribbling out of it. 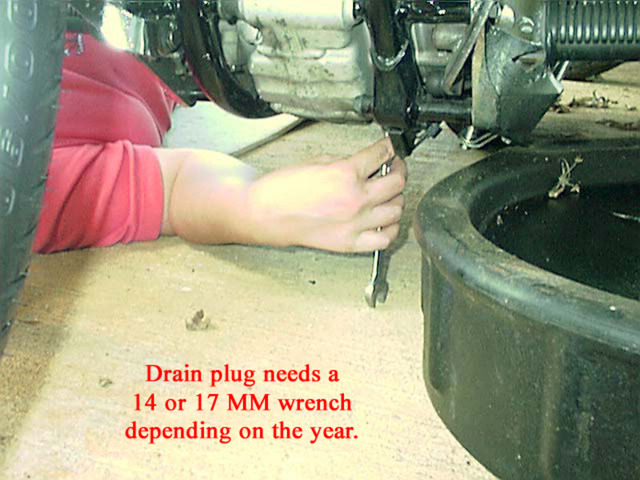 Let it drain, then replace the plug. 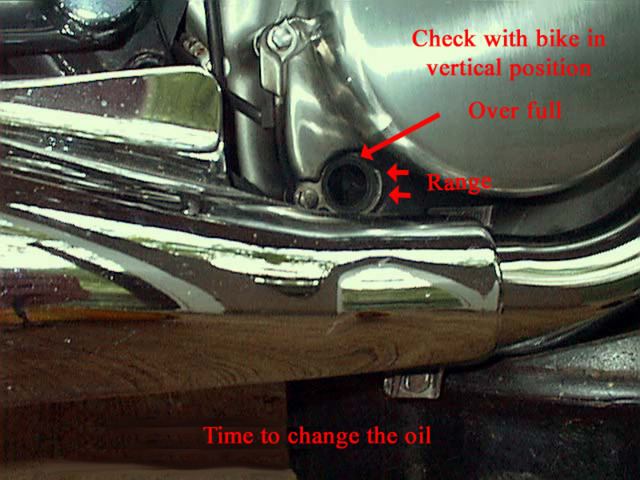 This puke tube gathers oil condensation and water condensation that forms in the air box from the engine breather. 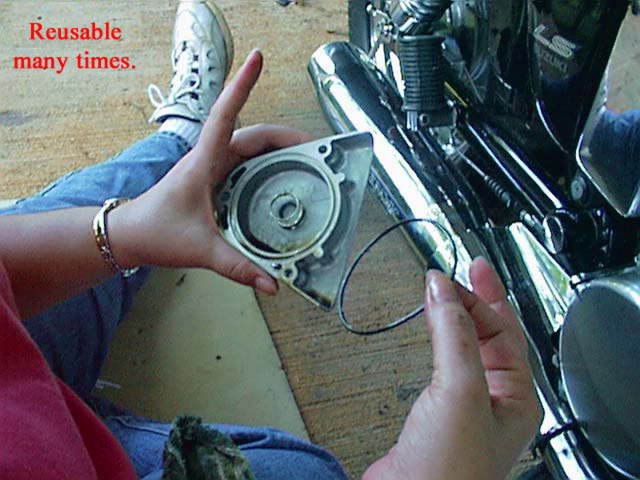 If not drained for too long a time, it can accumulate enough to go into the carb intake after gumming up the air filter. 'Taint good to ignore it. You are down there anyway and it costs nothing to drain it so just do it. Your bike will appreciate the extra effort. 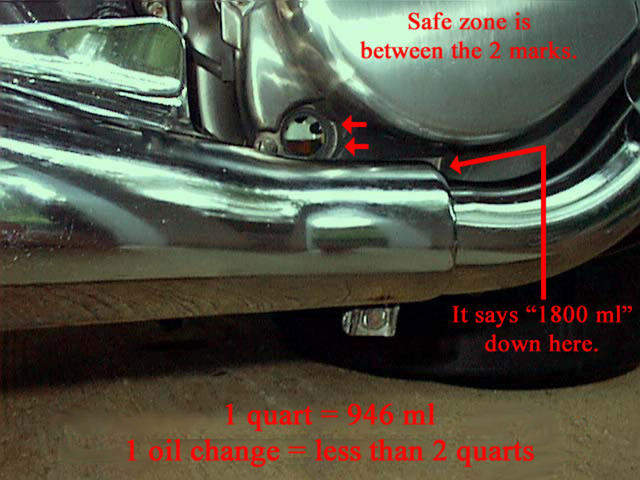 Here is a close-up view of the oil drain plug location that may help first-timers. This view is taken from under the front of the bike looking backwards. The kickstand would be to the right of this picture. Take a good look on how the filter sits in the pocket. Notice there's little hole in the middle of the filter that you can stick your finger in. Put it in backwards and this can happen to you! You got the filter in backwards. Then the spring which is on a spud on the cover. You should be able to press the cover in place with your thumb while screwing it down. If you can't push it up against the clutch cover, somethings wrong. 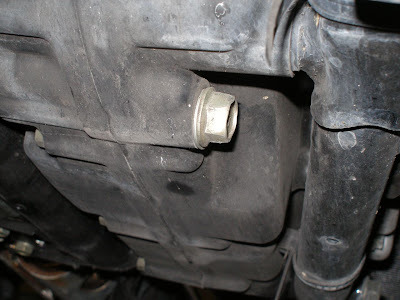 Could someone add torque values for the drainplug and filter cover screws to this page?